Well it’s January, the house is de-Christmased, and I am in the mood to organize. One of my favourite things in life. Some members of The Family who shall remain nameless would say I am Obsessed. I prefer Passionate. But seriously the best present I ever EVER got was my label-maker. Love that thing. I would take it with me if I was stranded on a deserted island. But I digress. The entryway. 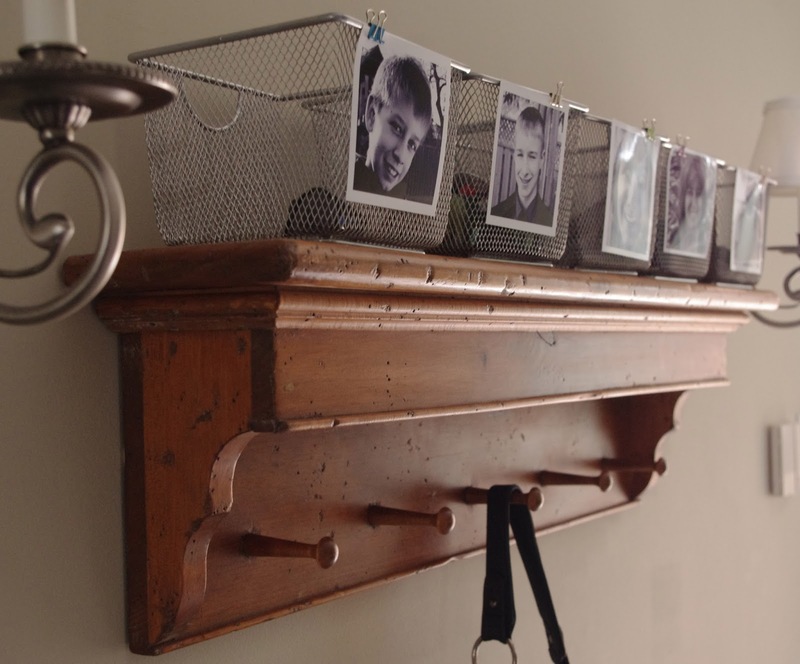 So the organizers/decorators of the world…myself among them…tell us that a tidy, well-functioning entryway should have a shelf/console table/cabinet…some surface on which to tidily drop our keys/sunglasses/mail/etc as we come in the door. So once upon a time Yours Truly set ours up with not one but two of the above. One for the mail with also a lamp, mirror above, vase of flowers. All organizer/decorator approved. And one for all the other stuff. Hmmm. It soon became apparent that this system would be excellent for a household of one or two, but not Five plus A Dog. A New Year’s resolution was in order to remedy this situation. I spare you the Before photo of random receipts/keys/reward cards/sunglasses/charging cables/pens/keys/dog treats piled on the shelf by our front door. 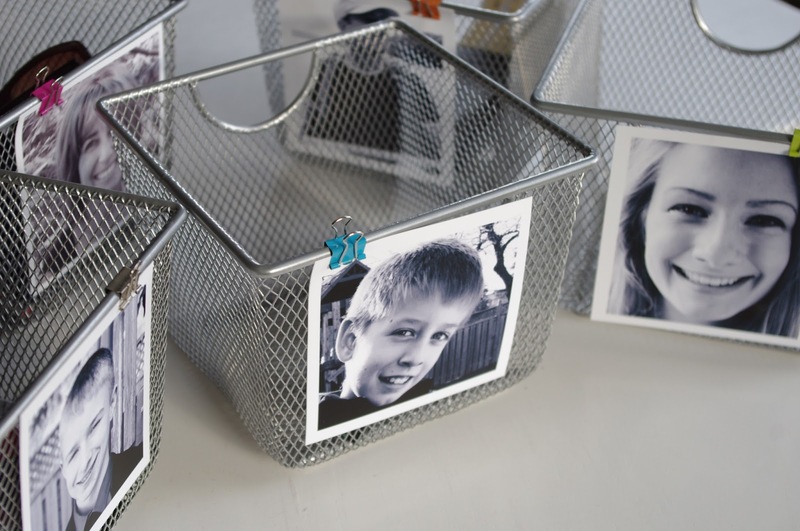 Plan B: Five of these stainless mesh baskets from Solutions. A most excellent store. A portrait of each member of the family converted to black and white for a fun contemporary way to identify each basket. An alligator clip to attach each photo. The observant among you will notice the clips are different colours. Yes each family member’s belongings and schedules have their own colour. Passionate. Not Obsessed. So here we have the end result. Personal and funky and functional. Notice that the five baskets fit perfectly along the length of the shelf. Thank you very much. Enough space for everyone to keep their own stuff tidy and accessible. No The Dog does not get her own bin. I draw the line. Her stuff stays hidden in the closet. And the closet is deserving of a New Year’s resolution of its own…another day. It remains to be seen whether this system will stand the test of time but I have high hopes.